This was an early holographic type of sight offered by Bushnell optics. This same sight has lasted for quite some time and is still built to this day. 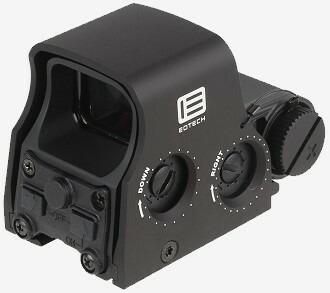 Of late, the folks at EOTech have moved into conventional rifle scopes as well. The industry seems to have no upper limits. Sit in the cockpit of an F-16 or drive a Corvette down the highway and you will know at once what a “HUD” display is all about. Heads up, the lens of a Holo sight has been around for some time. It has been used on both on AR Platform weapons and handguns for starters. 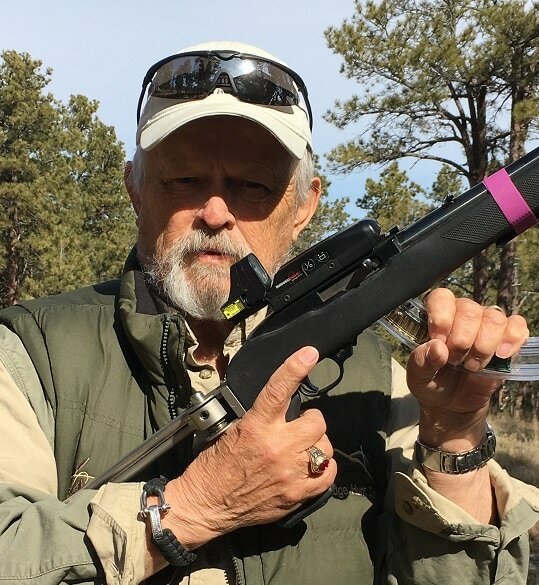 Author's first generation Bushnell HOLO. 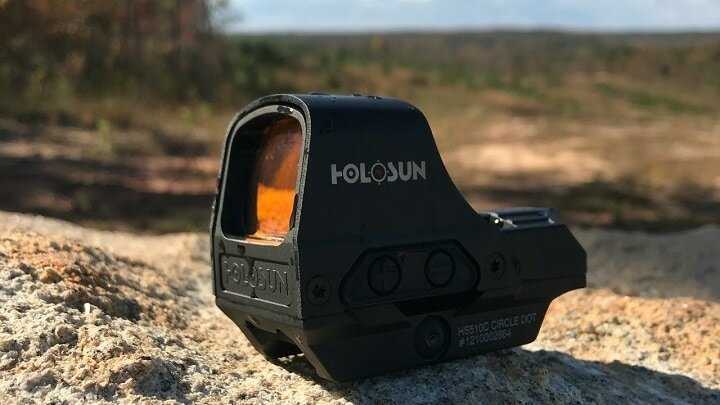 The holographic sights allows the shooter to shoot with both eyes open and simply line up a dot or other configuration of the sight on a target. Then, turn loose of some lead down range. Simple is the word---with an easy to use learning curve. 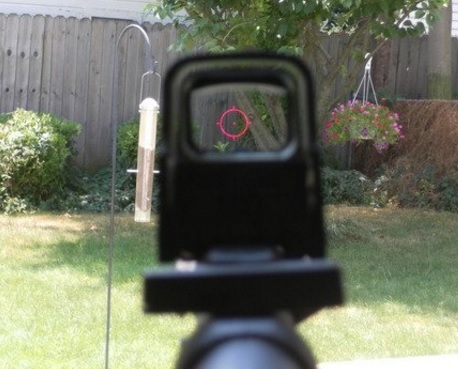 These are popular sights among both novice and professional shooters. 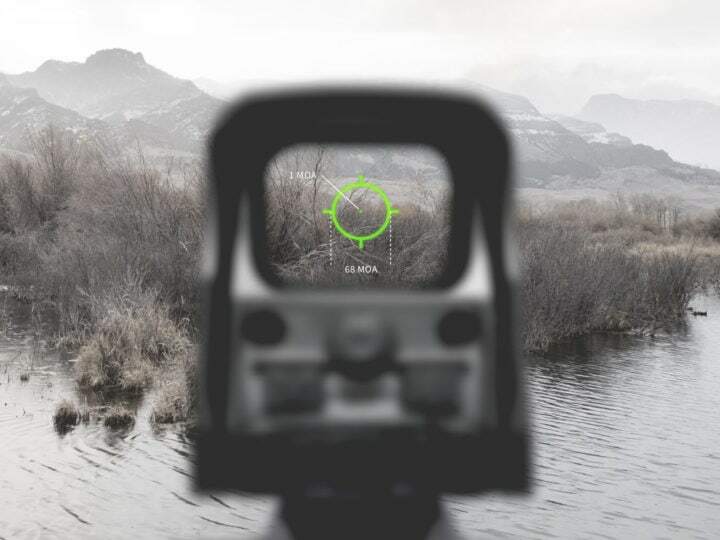 Eotech is a company that bought into the “HOLO" sight through Bushnell Optics some years ago. 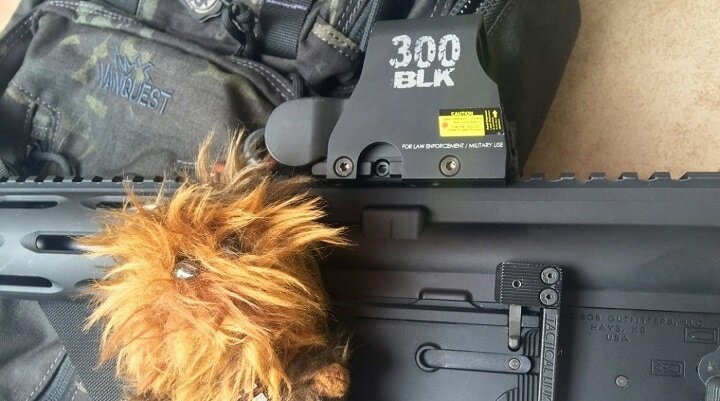 The company is a leader in military type holographic sights. They advanced the Bushnell brand design to what it is today. 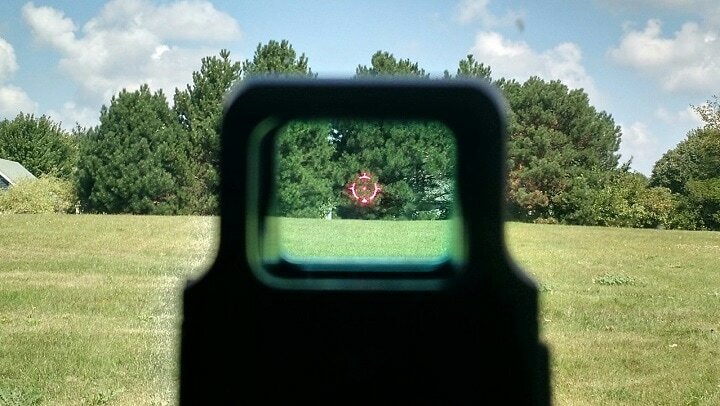 This sight is using a 68 MOA ring with a center 1 MOA dot. 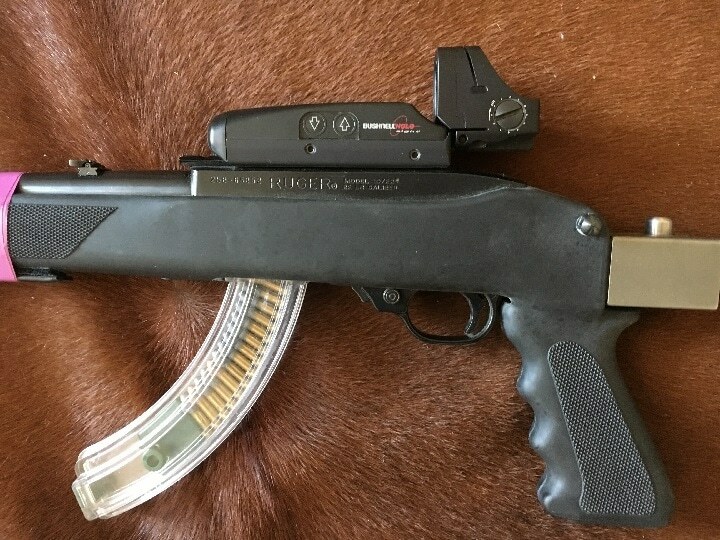 This is almost a standard with a combat style “Holo” sight nowadays. This sight makes use of a flexible Weaver style mount. 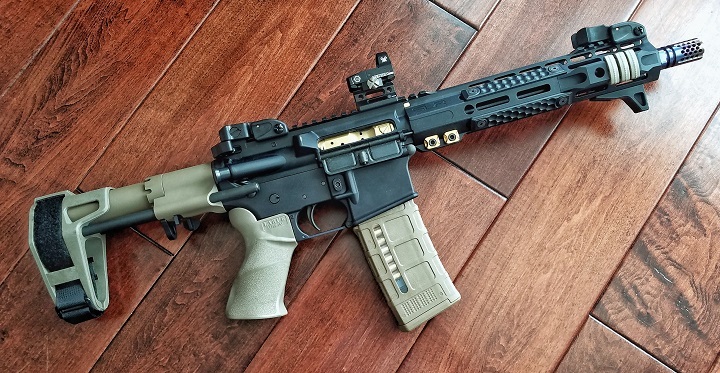 The sight is easy to get and simple to use on a wide variety of AR-15 platform styles. The unit is adjustable for brightness. This is very important because day shooting or night shooting will require different levels of amplified light across the red dot/circle surface. Too much light in a low light situation will blank out the target. Too little light and the dot will be hard to align with the target. 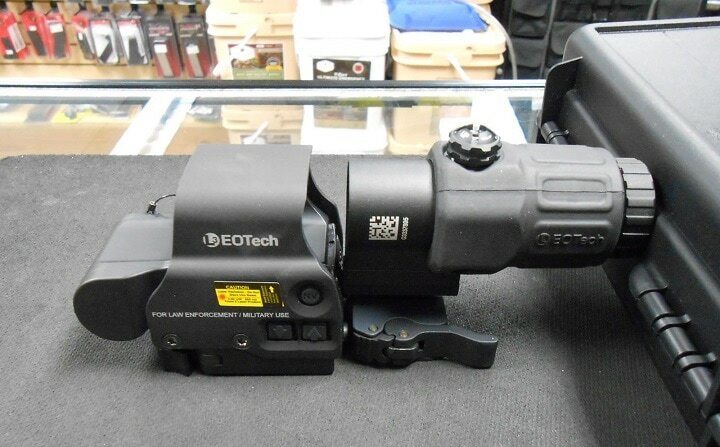 The Eotech 512 illustrated here retains up to 20 light intensity settings. This can meet any requirement by the combat shooter, general plinker on a Sunday afternoon, or hunter. The system provides for both day vision or night vision mode. Water resistant to a submerged depth of 10 feet the sight could be regarded as mil-spec in terms of survivability in the field. This sight with all its levels of adjustment is state of the art in “Hud” sight technology. This sight makes use of simple 1.5 volt AA batteries. The spec includes the optical transmission holo, parallax-free, magnification X1, eye relief unlimited, sealed fog proof internal optics, and sight adjustment of one-click per 0.6 MOA ( ½ inch ) @ 100 yards. The housing material is one-piece aluminum. The system is built to last a very long time. 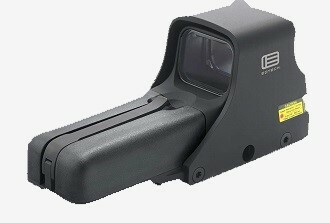 The price of Eotech 512 Holographic Weapons Sight varies, so check the latest price at Amazon. 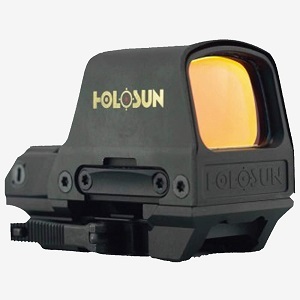 This Holosun holographic sight offers the use of both dot reticle and a ring style sight. This sight is state of the art in terms of its design and retains a built in a solar power energy source. 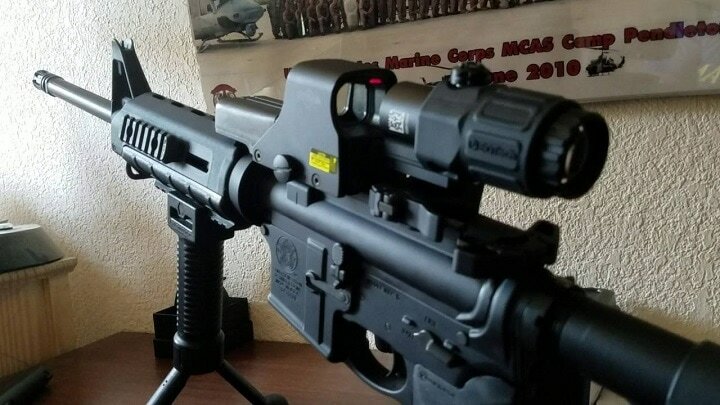 I believe taken from the ACOG military development this unit also makes use of advanced LED technology. When you combine the use of a battery as a backup and a solar energy function, you have a unit that will run 50.000 hours in terms of field operation according to the manufacturer. With a wide, unlimited field of view and the use of high-quality optical glass as part of its reticle design, this is a grade A unit by all standards. Reticle aim point/dot measures 2 MOA. The outer, second ring measures 65 MOA. This makes for easy sight in pickup against a moving target or static subjects. Built of titanium as a one-piece unit, this sight is indestructible as a professional adaptive system on a police or military AR-15/M-4 class weapons system. 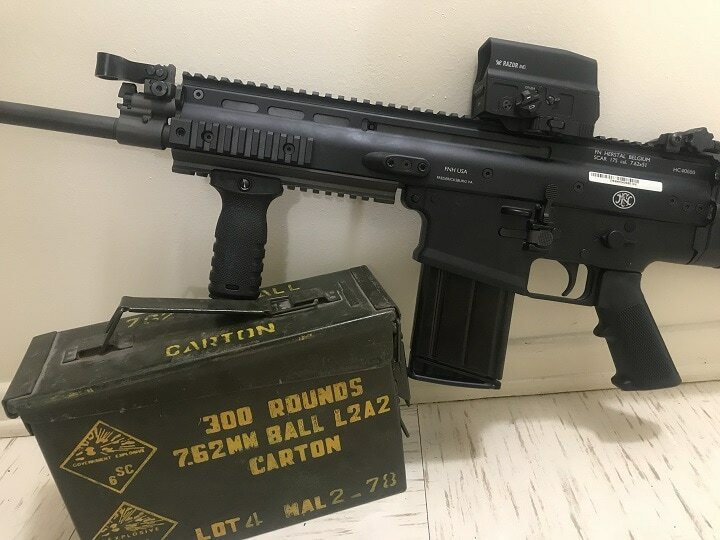 Non-professional shooters will also like this unit when used in three gun competition games and in most forms of close quarter shooting. This unit is a “gunfighting” sight system. The price of Holosun HS510C varies, so check the latest price at Amazon. 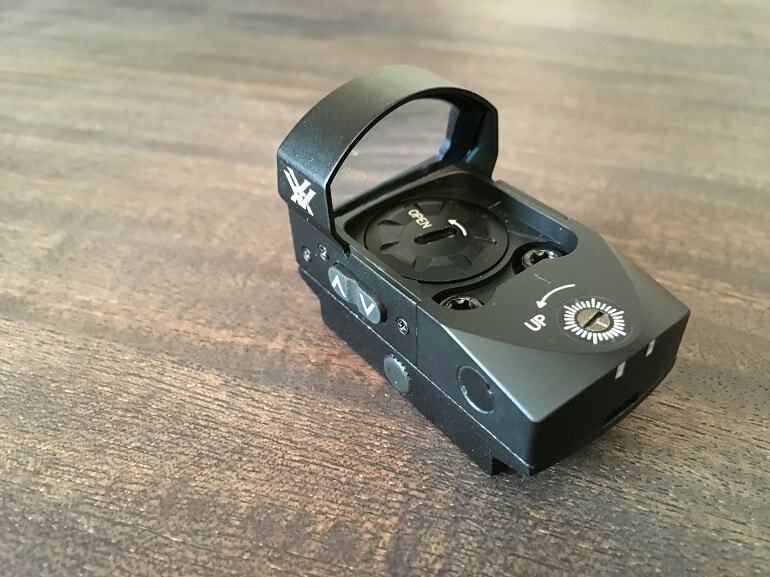 This is a newer entry to the HUD optical range of sights. The Vortex engineers learned from the past and built a totally new unit for the most part. 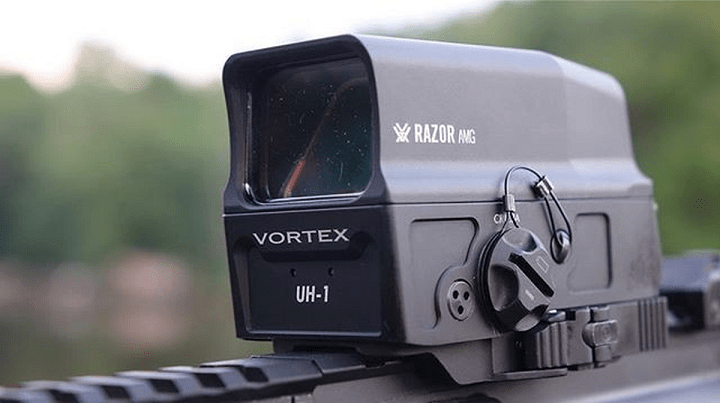 This Vortex “ Razor” is a paradigm in holographic sight construction. The system makes use of very high-quality, energy-efficient systems that have no moving parts. The sight picture based on the glass used in this sight is outstanding in terms of quality. The reticle delivers zero distorted features on a target surface. What you see is what you can shoot. When using this system eyepiece, glare and stray light are eliminated completely. The Vortex Razor AMG UH-1 retains a very efficient battery unit that can be recharged by way of an onboard USB port when rechargeable batteries are used. Or, you can just change out standard dry cell batteries over time. 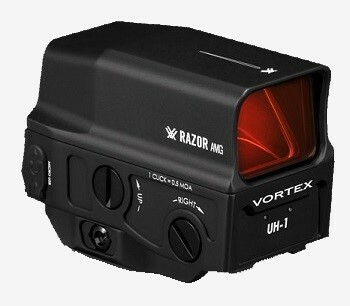 The price of Vortex Razor AMG UH-1 varies, so check the latest price at Amazon. 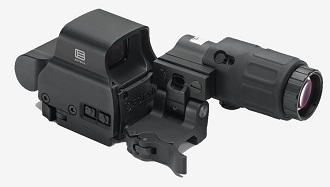 This optic as a second sight in the series of Eotech products is a flexible military police sight. Because of its small size, this optic can mount a best 3x magnifier as a part of the sighting system using an extended rail mount. This type of sight magnifier is military all the way. It takes a sight design like the XPS2 when accommodating a system like this one. The sight retains a reticle in a 68 MOA ring with a 1 MOA circle on the outside. This sight mounts to any system that makes use of a Weaver rail or some type that is compatible with the previously listed rail. Brightness settings are produced by a manual control with 20 settings. There is a daylight setting with scrolling features (optional 10 settings for night vision). There is an auto battery check system. The sight will flash on and off if the battery power is running low. The eye relief on the sight is unlimited. In most cases, the optic is designed to shoot with both eyes open which is the military tactical approach to a gun fight. 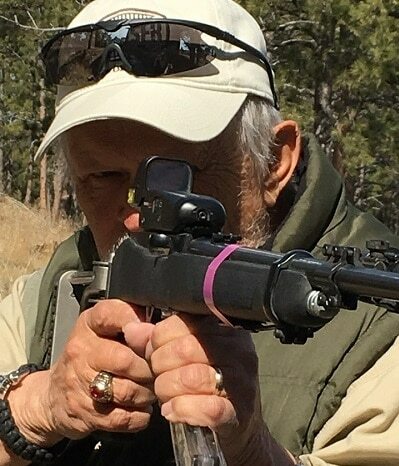 Sight adjustment is 0.5 MOA per click 1/2” at 100 yards when zeroed. The adjustment range for elevation is 40 MOA travel. It is suggested that the user install a riser with a Weaver rail for heads up style shooting. Searching on the glass lens for a sight picture is not an option here. This sight features an anti-reflective coat on all external surfaces. The forward window material is 1/8” solid glass. The rear window is 3/16" thick laminated glass. The field of view at 100 yards is 30 yards with a 3” eye relief. This optic system is a heads up fighting display and not a part-time field tool. 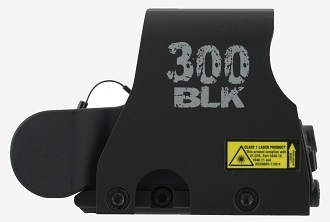 Based on the price, it is one of the most costly in the area of “HOLO” sighting systems. The price of Eotech XPS2 varies, so check the latest price at Amazon. This is the Ultra Shot M-Spec HOLO sight by Sightmark. This field reflex sight is designed to be fast and work quickly as a room/structure clearing system, street fighting tool, or gaming system for three gun and others. As a close range sight, it is designed to meet the task when used with the best AR 15. This holographic weapon sight is parallax corrected and scratch resistant in terms of the lens system. The sight retains unlimited eye relief with an illuminated red circle as a sight base. The main housing is made up of a cast magnesium material. This unit measures 6X4X2 inches and weighs one pound. The available colors include flat dark earth or matte black. The eliminated brightness reticule makes use of a 1 MOA dot and as such becomes a ranging tool. It covers a 5' 9” man's vitals at 100 yards. The issue with these systems among hunters is that they block too much target surface at any extended ranges. Accuracy in terms of placing shots on vitals becomes compromised. In effect, these are combat sighting systems and best used over other sight systems for close range work. Recoil rating on this optical system is very high. The sights have been attached to the 50 BMG successfully as applied to field use. This sight uses a common R2/3V lithium battery and will return 90 hours on the high setting and 1000 hours of working life using the lower energy setting. Operating temperature will be from -22 -F. to +160 – F. The total range of sight adjustment is 120 MOA. The price of Sightmark SM2600 SDE varies, so check the latest price at Amazon. The Vortex Venom sight is like a HOLO display in that I uses a single window with a red dot 3 MOA aim point that is set by windage and elevation adjustment controls. 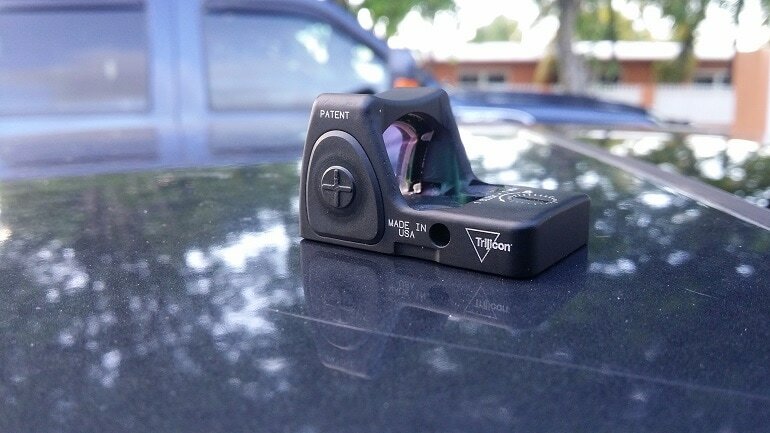 This is a rapid target acquisition sight and will still provide precise aiming within its proper range reference. This optical system makes use of an all aluminum housing that is one piece constructed. The optical glass is high quality and is fully coated for protection. It offers a clean wide field of view for both eyes open shooting. You see the target and area on both sides as well. The power controls are located on the left side of the sight making it easy for the right-handed shooter that wants to maintain target visuals while changing the light intensity an easy task. This unit has 10 total brightness levels for the various light conditions in the field. This system also has an auto ambient light sensor control that alters light handsfree for the shooter. 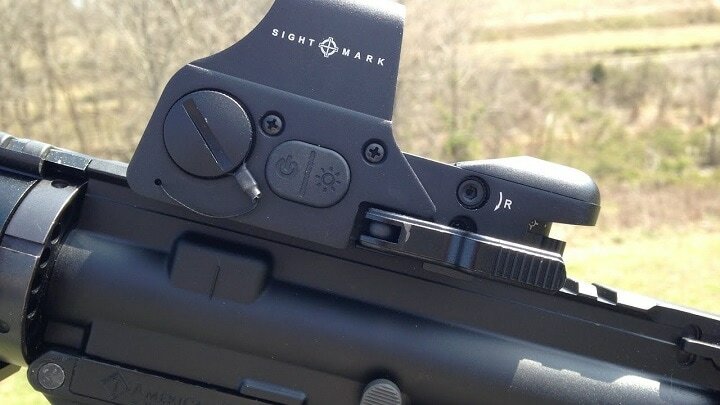 This is an optional control and need not always be applied to adjusting the point of the red dot optic for ar 15. Range adjustment controls are easy to use and retain a 1 MOA level of adjustment per click. Battery install is very fast and simple. The unit uses a CR1632 lithium battery that is commonly found in stores. 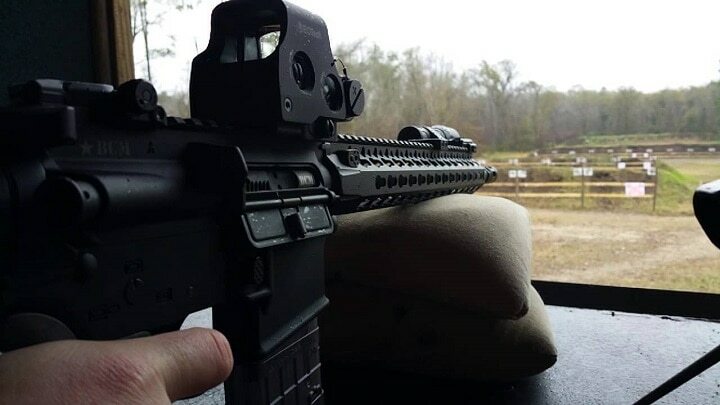 The installation and use of an AR riser are recommended with this sight. 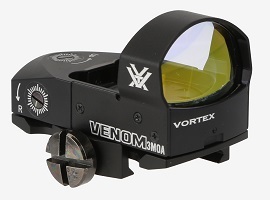 The price of Vortex Venom varies, so check the latest price at Amazon. 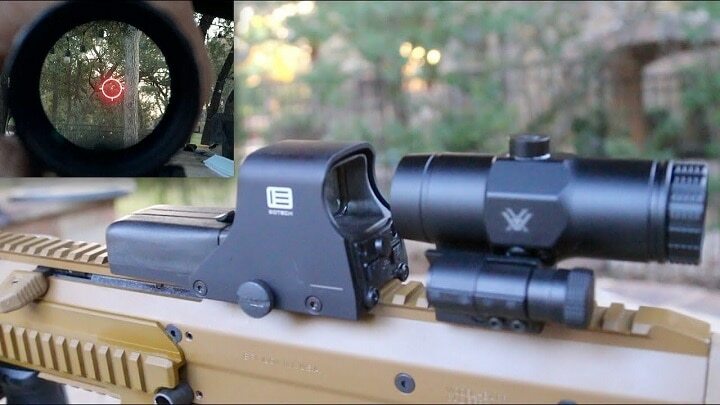 The EX-PS2 Magnifier Combo makes this HUD display sight an effective long-range system. The combination of the EOTech Holographic sight Hybrid sight with the G33 magnifier enhances the capabilities of the total sighting package. With the 3X increased magnification system, the weapon's sight range is extended greatly. The click value is ½ MOA. The battery life is 600 hours when on a selected setting of 12. 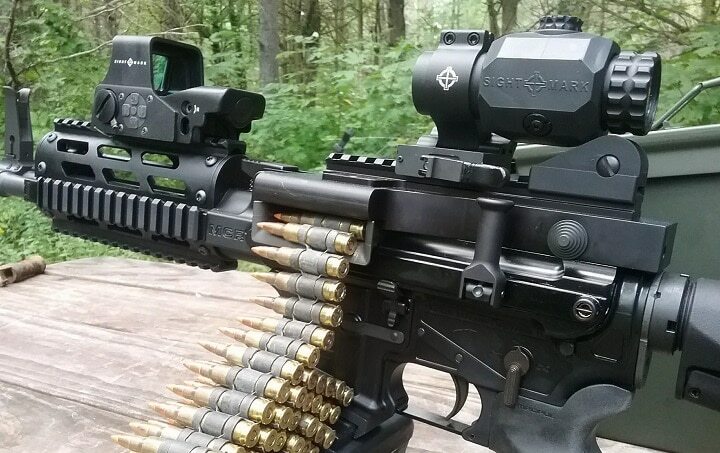 Specs associated with the sight are the same as those listed for the EOTech optical systems. 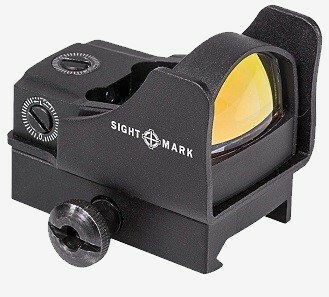 The magnifier allows a second green dot sight that is user-friendly in bright light conditions. This sighting system does not provide a night vision mode. The price of Eotech-HHS EXPS2 varies, so check the latest price at Amazon. 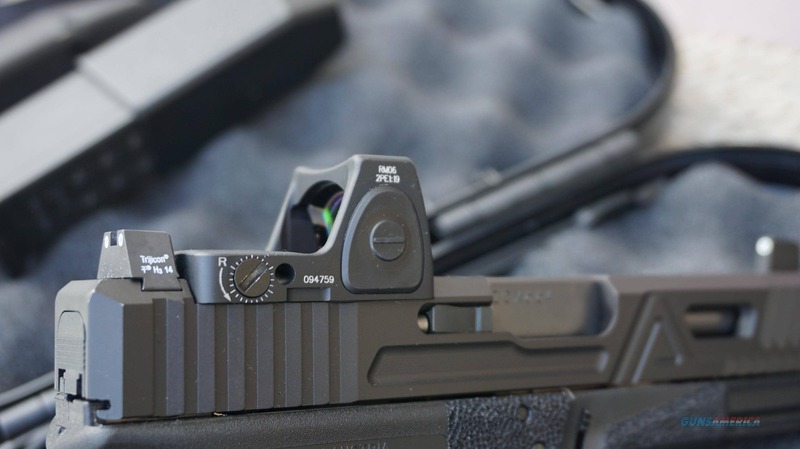 Heads up gun sights are increasingly evolving due in part to the advancements in ordnance systems. 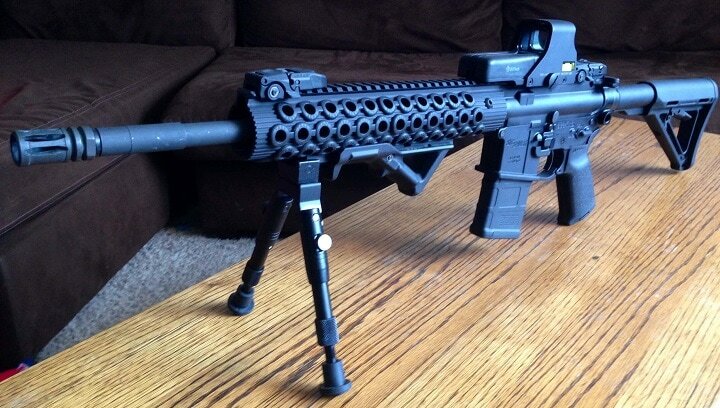 The AR-15 is not just a .223 Remington chamber rifle any longer. There are many sights that will accommodate other chambering as applied to the M-16, AR-15, and M-4 weapons systems. This holographic weapon sight was developed with the tactical shooter in mind. 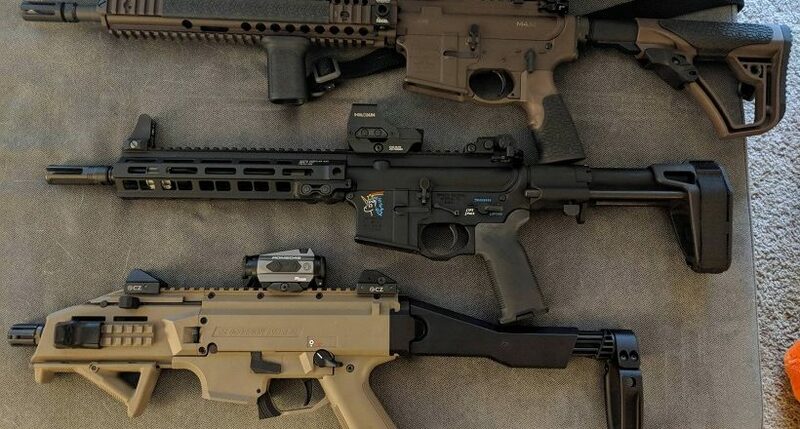 Those who participate in three gun and other related combat games, as well as law enforcement and military personnel, will like this optical system. 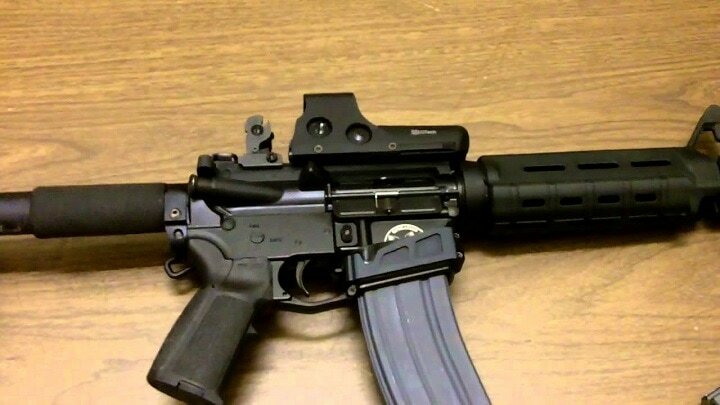 It is a good fit for budget AR-15 shooters in general. The sight allows the user two different ballistic reticles that work well with both standard velocity ammunition and sub-sonic loads as well. The 300 BK is known as a door building entry style weapon in some cases with sub-sonic (quiet ammunition applications). Offered in the XPS2 platform, this is the shortest and smallest sight package available in the HUD style sight system today. Again, developing sighting units for the 21st-century warfighters as well as general AR-15 shooters. The price of EOTech Blackout / Whisper HOLO sight XPS2-300 varies, so check the latest price at Amazon. 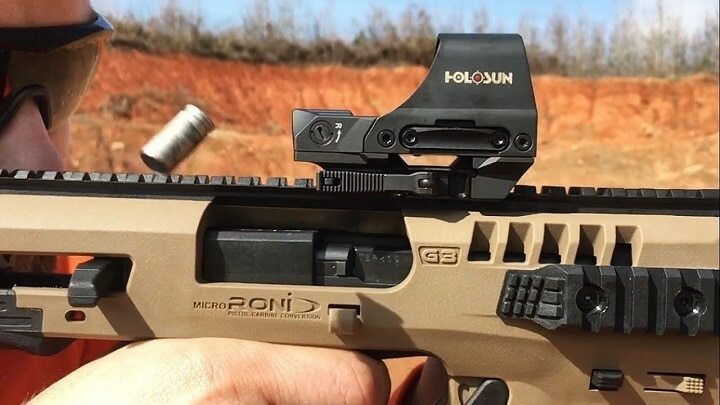 This 6.5 MOA LED RMR adjusts for light level automatically. No controls or buttons to push here. This is a self-contained/built in system. As light changes so will the reticule value. There is not a single light adjuster to be found on this optical system. This unit has a very dependable electric design. The sight is a harsh conditions survivor without question. After all, it is a Trijicaon product. From years of field experience, I can tell you this is top of the pile when it comes to special grade A gear whether being used for gun fighting or hunting game. As a final note, this sight retains adjustable windage and elevation clicks to 1 MOA per click. The price of Trijicon RMR varies, so check the latest price at Amazon. This is the heads up “HUD Bushnell” system and has been in service for over 20 years to date. Largest task applied to the sight was the removal of 700 starlings from a ranchers front yard some years ago. Bricks of 22 LR ammo and a skeleton stock 10/22 with the heads up sight did the deed.